It’s a seemingly simple task – according to the client; and it has to be done today. You could handle it, if only you had more time; a lot more time in fact. Excel isn’t the solution. 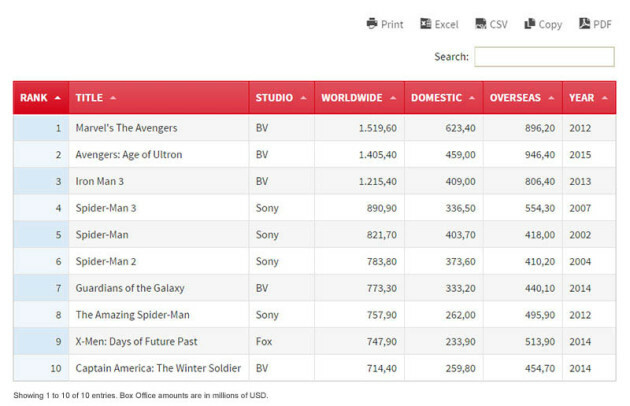 You need to create a table that is responsive and interactive, and by the way – fast. Your coding expertise isn’t up to the task; far from it in fact. But wait, is that a superhero approaching? It is! It’s a tables and charts WordPress plugin that is coming to your rescue. This superhero in your time of need is the strongest, most versatile tables and charts tool there is, that can deliver quality results at super speeds when you are creating charts and tables in WordPress. It’s called wpDataTables. What superpowers does wpDataTables possess? Your battle may be with a pretentious client who assumes any task you are assigned is one that anyone could do. Or, it might be a battle of your own, like how to resolve a tricky problem with MySQL; when the truth is, you aren’t quite the expert you wish you were. Even spending hours fixing a nasty little CSS bug that someone with the right tool could solve in minutes, is enough to look to a superhero for help. Superheroes are known to change shape to meet and resolve the problems they face. This plugin adapts to information presented to it in the format of your choice. It easily adapts to .csv files, Excel files, .xml, JSON, and even serialized PHP arrays. This plugin will even make generating tables directly from MySQL to provide real time data, a snap. Superheroes are known for their ability to create wormholes or spatial portals. wpDataTables can do so as well, and in an instant; plus, the end result will be responsive in any WordPress theme. wpDataTables has an uncanny knack for bending information into just the right place, and not only preserving its integrity, but providing you with attention-getting visualization charts, whether you are working with Highcharts or Google Charts. wpDataTables does a pretty impressive job of highlighting table elements, calculating sums and totals on the fly, and other neat manipulations while, as before, maintaining the integrity of the information it is working with; much like Excel. To see how this cool conditional formatting feature works, click here. Any superhero worth his (or her) salt can see through things. With its intuitive dashboard, wpDataTables can see through mountains of information to find what is important for the task at hand. Its Table Constructor enables you to auto-generate SQL queries to existing tables, import existing spreadsheet files, or create MySQL tables from the dashboard itself; tables which can be edited directly from WordPress. Super strength is good to have when you have huge amounts of data to list or arrange, and be able to do so quickly. 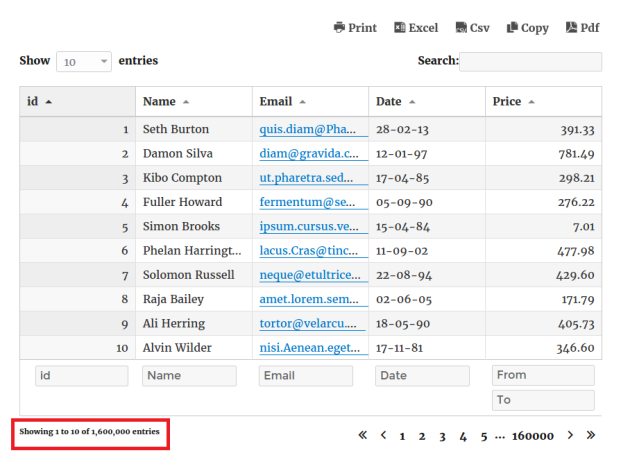 wpDataTables can generate tables with a huge amount of data – 1,600,000 entries in this example. The super strength the data manager now has comes from joining forces with the MSQ engine, with some assistance from Ajax requests. There is seemingly no limit as to the amount of filtering, sorting, etc. that can be done, while keeping everything under control. It’s a great example of what muscles and brains can accomplish. 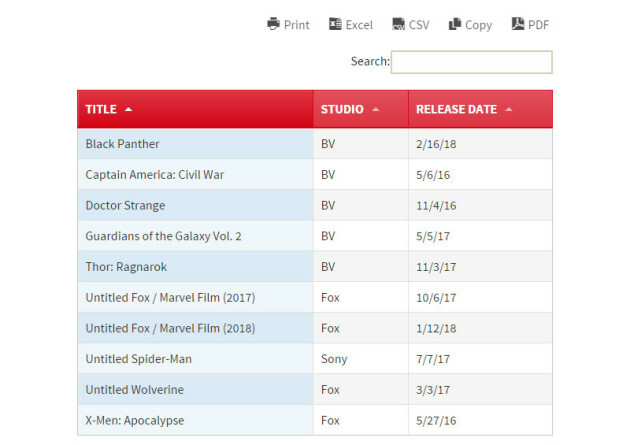 The following table, generated with wpDataTables, shows the top 10 box-office performing Marvel movies, and it can be printed or downloaded into a PDF, Excel, or CSV file with a single click. Awesome, right? Now that you’re convince this superhero plugin deserves a special place in your design toolkit, you may be wondering how you can best put it to use. 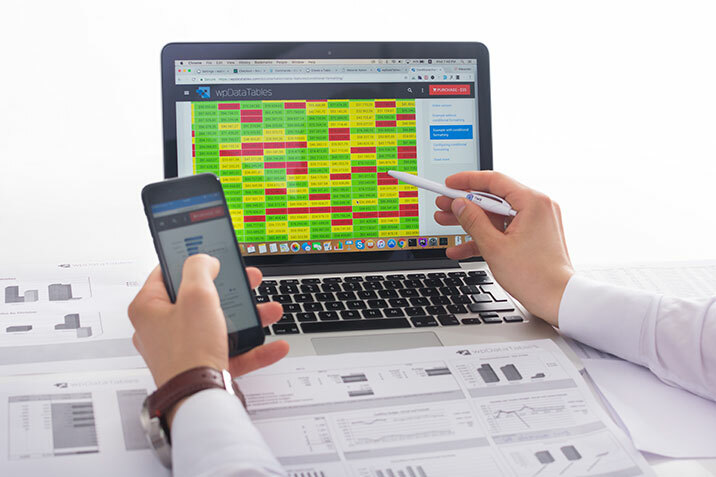 There are many different applications, ranging from financial and operating statistics, to results from complex analytical tasks, to managing large service or product catalogs. These types of applications often test your design capabilities to the limit, but with a superhero plugin such as wpDataTables at your fingertips, the near-impossible just got a whole lot easier. What do wpDataTables users have to say? 85% of them will tell you they use the advance filtering capabilities, and 75% of them have found the MySQL data visualizing feature valuable. A third report they have made good use of the front end MySQL table editing feature, Excel file visualization, and applying the built-in MySQL query generator tool. 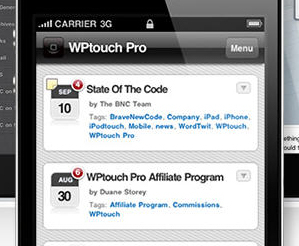 80% say wpDataTables is an intuitive, easy to use, plugin. wpDataTables has a great deal to offer. It is a powerful, easy to use design tool that works with any WordPress theme. With this plugin, you can create a responsive table in WordPress in minutes, without having to use a single line of code. It can generate tables that deliver real time data, and do so directly from MySQL. It generates data at super-speeds, and its advanced filtering features can save hours of table design work. Super powers excel at doing small things as well as taking on seemingly impossible tasks. The ability to manage small details while working with complex data can be a real time-saver, as is the ability to easily print or save information you are working with in several standard formats. Check out a demo and visualize how wpDataTables can help you create tables and charts in WordPress. Any idea if this could work with Formidable Pro forms? While we honestly didn’t work with Formidable Pro forms yet, we believe that as most of other plugins it stores the entered data in the WordPress database. So it’s a question of preparing a correct MySQL query, which returns the data that you would like to put in the table. Usually it isn’t complicated. We have in our development backlog tasks for building native integrations with popular form builder plugins, to make this kind of tasks easier for the users.